They might have been rated 13th and 14th on the NRL ladder, but the Bulldogs and the Sea Eagles came into Saturday night’s game at Lottoland pumped from a pair of resounding victories. On the one hand, Manly had beaten Cronulla at the death with a golden point victory, while Canterbury had come away with a stunning win over the Broncos that made it clear that their victory over the Wests Tigers the week before was no fluke. An unseasonally warm evening in Sydney made the game even more heated, with both sides defending their line again and again, resulting in only one try being clocked up in the first forty minutes. For a moment, it looked as if Moses Suli would put down the first points of the game, thanks to a superb offload from Marty Taupau – the sixty-third of his career – that sent the massive backliner tumbling over the chalk. The replay showed, however, that Tom Trbojevic had intentionally knocked the footy forwards over David Klemmer’s head the play before. Nevertheless, the Sea Eagles got the first points, thanks to a sequence bookended by Matt Frawley, who put Rhyse Martin under too much pressure with a clutch pass at the Bulldogs’ end of the field, and then gave the home team a slow peel in front of their posts, making it a no-brainer that Daly Cherry-Evans would take the two. Shortly after, Will Hopoate outdid Turbo under the high ball, leading to a Canterbury set that seemed to brim with tryscoring opportunities, from a deft offload from Hoppa to Reimis Smith, to a hard run from Klemmer, to some good work from the Morris boys out on the left edge, only for a forward pass from the blue and white fullback to bring it all to nothing. The same thing happened again a few sets later, when Frawley put in a massive effort to follow up on a last-tackle kick and just prevent Turbo getting back into the field of play. This time, it was Adam Elliott who was unable to capitalize on the Bulldogs’ field position, in the one real blemish on an outstanding night for the big Tathra second-rower. With so much momentum, however, it was only a matter of time before the Dogs scored, and even if it happened later than initially seemed likely, it still felt right that they were the first to cross over. Here, as throughout the entirety of the game, Klemmer was a huge unit on the field, almost managing to go it alone halfway through the tackle count, and exhausting and disheveling the Manly defence enough for them to be taken by surprise when Michael Lichaa sent an oblique pass back to Smith while Josh Jackson was running an elegant decoy line. 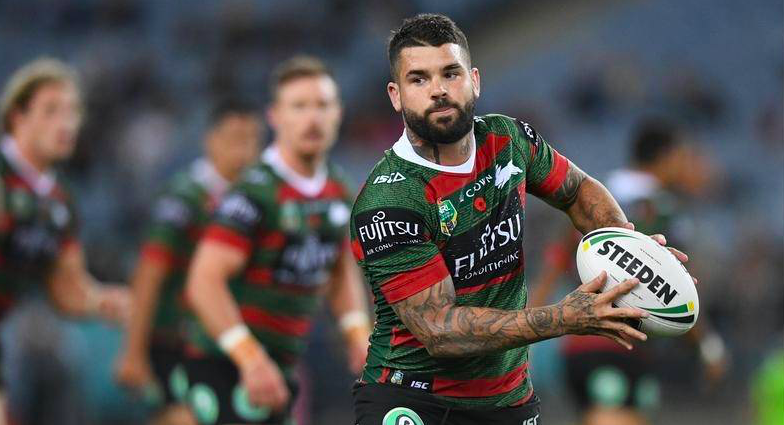 Rhyse Martin now added the extras as consistently as he has over the 2018 season – he’s now kicking at just under 94% – gifting the Dogs a surge of adrenaline that was only enhanced by a series of Manly penalties and errors. First, it was Trent Hodkinson for being offside, then it was a mistake from Kelepi Tanginoa, with a slow peel from DCE resulting in an official warning for the home side. A professional foul saw Hodko sent out ten minutes from the siren, and yet the only team to score over these last minutes were the Sea Eagles, who ironically notched up a penalty goal of their own as the siren loomed. Still, it was a bad sign when Hodkinson got another after returning to the field forty seconds into the second stanza. 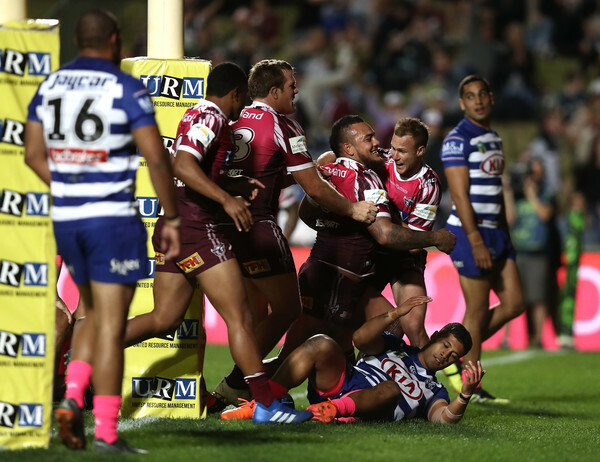 The fact that it was identical to his first penalty made it clear that Manly needed to do something to break the stalemate, and to reclaim some leadership and ownership of Fortress Brookvale. In the current squad, moments like that usually call for some kind of linkup between DCE and Turbo, and sure enough the two key players in the Manly spine effected a dexterous linebreak a couple of sets later, forcing Hoppa to shepherd the Steeden into touch despite his best efforts to leave it until the last second. All of a sudden, Manly congealed on the next set, thanks to a pair of passes from Jake Trbojevic and DCE that found Turbo on the left edge of the park, where he danced out of a tackle from Kerrod Holland and turned Smith inside out, before crashing through a combined tackle from Hoppa and Jeremy Marshall-King to ground the football in the corner. Sometimes the freakishness of wing tries is what stands out, but this time it was the relaxation and leisure of Turbo’s putdown that really impressed, since even in real time it was clear he’d had room to spare before his foot crossed over the line. Despite already having four points on the board, the Sea Eagles had now scored their first try, and it had come so late in the match that their best bet was just to repeat the formula. That’s exactly what they did a few sets later, when they chalked up four more directly out of the scrum, thanks to an identical sequence of passes from Jake Trbojevic and DCE to find their fullback waiting for them on the left edge. For a moment, it looked as if Turbo was going to add a little epilogue of his own, shifting the Steeden across to Brian Kelly to cross over in his place. In the best twist of the game, however, Kelly offloaded the footy back to Turbo as he was being brought to ground by the Bulldogs defence, for a short ball that played every bit as precisely and calmly as if he’d simply handed it to his fellow backliner without a blue and white jersey in sight. The try was just close enough to Turbo’s opening effort to continue its momentum, and just different enough to allow the Sea Eagles to flex their muscles and get more expansive in their footy over the next couple of sets. The one dampener was Hodkinson’s kick, which just missed going through for the first try, and came even closer for this one, careening off the uprights to keep the Sea Eagles to a converted try lead. DCE’s kicking game had been pretty strong all night, but had only grown in precision and purpose over the second stanza, cuminating with a last-tackle option that saw Hoppa held up by a massive swathe of Manly jerseys beneath the uprights. Watching the home team trying to keep the Canterbury-Bankstown fullback in the in goal area was like seeing a trysaving tackle in reverse, as Manly’s defence and attack fused into a renewed sense of focus and conviction as the second stanza wound down. It wasn’t just DCE’s kicking acumen that served his team well, but his vision and perception of when to kick. After Kelly crashed over the line, but landed on his back, the Sea Eagles were pumped with adrenaline, resulting in a powerful set that saw DCE with the football right on the line. He could easily have grubbered between Jackson and Elliot, but instead read the next play perfectly, sending a beautiful short ball across to Addin Fonua-Blake to slam through four Canterbury defenders for the toughest try of the night. The Dogs had now spent most of the second half in their own twenty, meaning that when Smith burst up the sideline it was with all the frustration and pent-up energy of all that thwarted attacking energy. A weird sequence now followed, part chaos and part inspiration, including a flick pass from Brett Morris that Elliot caught beautifully, and some clutch work from Jeremy Marshall-King, only for it all to end with a chip from Klemmer that was cleaned up immediately by the Manly defence. Canterbury-Bankstown got one last big chance in the dying minutes of the game, after Taupau seemed to be lifted above the horizontal without resulting in a penalty, and then Lane lost the footy a tackle later. It was a make or break moment for the Doggies, who’d only made four tackles in the Sea Eagles’ twenty since the break, but it didn’t go anywhere, with JMK seeing a good gap but following it with a poor pass back, and Fa’amanu Brown steering the play away from his Canterbury team mates to undo any structure they’d been able to envisage. It felt like an apt summary of the game, then, when Brad Parker slammed Josh Morris into touch two minutes out from their end. The Sea Eagles might have struggled in the first stanza, but they’d shown just what they could do when they refocused over the back forty minutes, while DCE and Turbo, in particular, stood as a testament to just how much good leadership can achieve when a team is falling behind. Meanwhile, this was a sorry sequel to the Bulldogs’ win over the Broncos last week, and they’ll be looking to regain a bit of pride when they take on the Warriors at home next week.